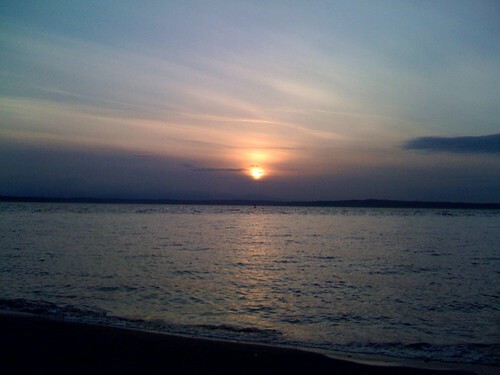 UPDATE: When I lived in Seattle, I sometimes rode my bike or the bus out to Golden Gardens Park in the afternoon. It’s just a really nice place to spend some time. David and I walked along, smelling the smoke from a number of campfires on the beach (the parks department provides big iron fireboxes). It was the end of the Memorial Day weekend, but plenty of people were there to grill, picnic, chill, or even get married (there was a wedding reception in the old bathhouse, which must have been restored as a community hall since my time). We’d driven out there to have dinners at Ray’s Boathouse, a Seattle seafood institution. We had a great meal and a nice table by the windows – they have an awesome view of the water and sunset. This entry was posted in Moblog, Traveling Along, We're Adventurers, Uncategorical Weirdness and tagged Seattle by ginny. Bookmark the permalink.